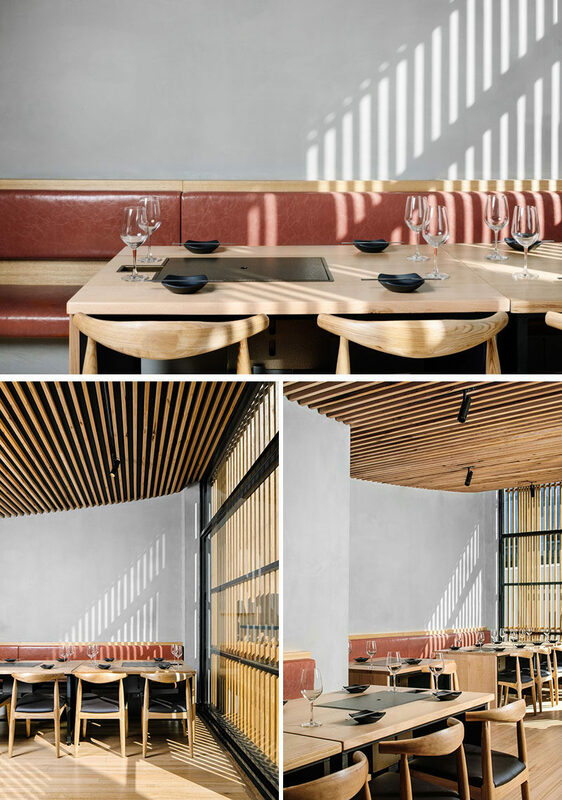 Australian architecture and interiors firm Biasol, have recently completed HINOAK, a modern Korean barbecue restaurant in Melbourne. 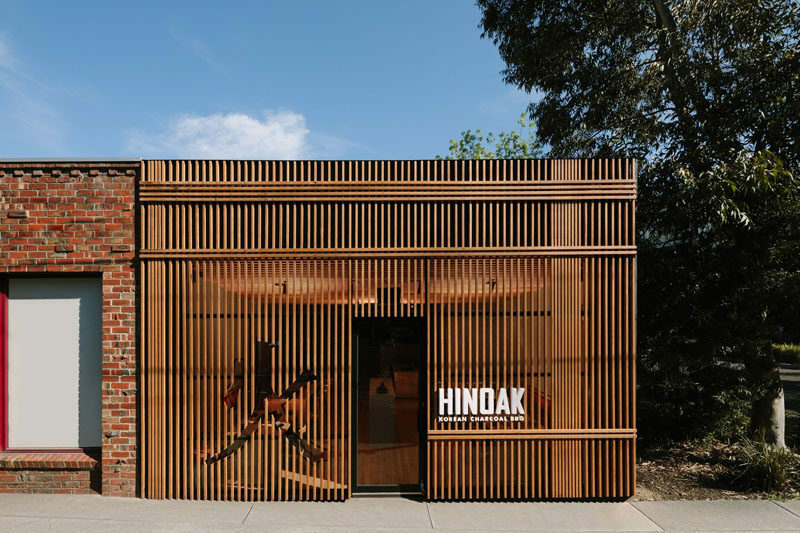 Inspired by traditional Chinese iconography (which is used in Korean culture) and the work of Japanese architect Kengo Kuma, the facade of the restaurant has a slatted wood exterior with a character cut-out and bright white signage. Inside, the ceiling reflects elements of the finely crafted eaves of traditional Korean houses. The timber-battened ceiling descends gently from the front of the restaurant to the back, and at the end it curves into the rear wall and hides the door. The interior of the restaurant with its soft grey walls, has banquette seating and two banks of timber tables with integrated charcoal barbecues. Instead of having pendant lights hanging above the tables, the designers installed LED backlighting behind the banquettes. 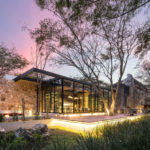 The bar at the rear of the restaurant is encased in terrazzo tiles and topped with sculpted timber benchtops that sit atop the bar in sections. Above the bar, suspended black display shelving descends from the ceiling, and behind the bar, there’s a backlit niche cut into the wall that displays fine spirits. 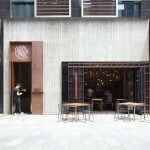 On the walls, the restaurant’s logo and brandmark have been debossed into the concrete-like wall surface. 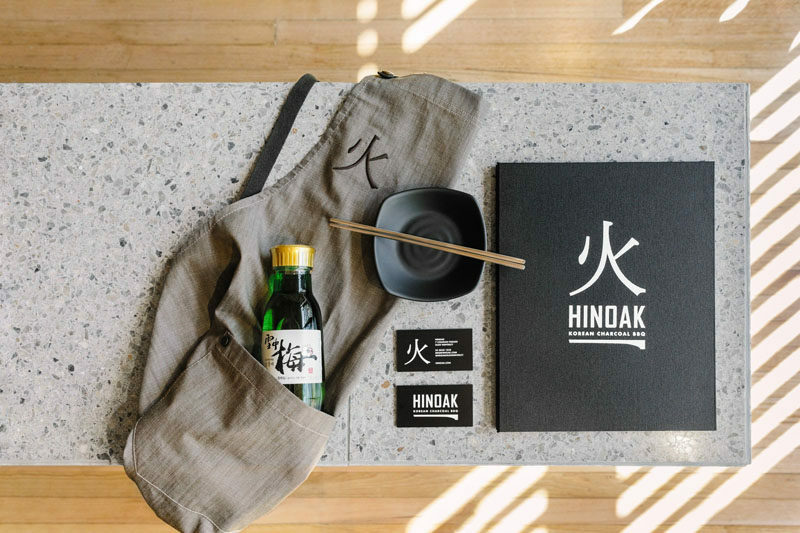 The branding for the restaurant is focused on the Chinese symbol for ‘fire’, which is commonly used in Korean culture. 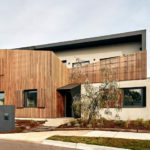 This character features on the printed materials, has been cut into the wood slat facade and as seen in the photo above, featured on the wall.